Click to buy Davy Jones’ Curse! 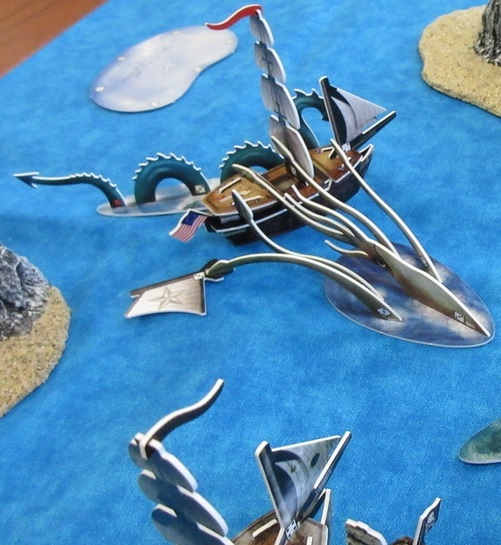 Sea creatures in action against the Pequod, also from DJC! 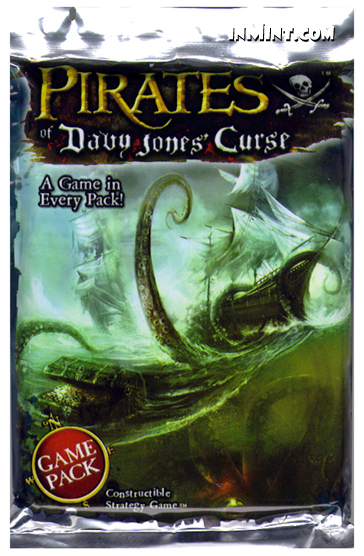 Pirates of Davy Jones’ Curse (DJC, 2006) is easy to acquire and features the Cursed and their sea monsters. This is when the game marked a dramatic turn from mostly historical content to some fantasy content. In some ways one could argue it was the “beginning of the end” since it drove away some of the player base, but it did attract a younger audience for the sets to come as well. In addition, this set is when the reverse power creep began – meaning that the general effectiveness of game pieces began to decline. The Cursed faction and sea creatures were part of it in this set, but ships also began getting slower in this set. You can find all of the game pieces in the Master Spreadsheet, and I’ve ranked the Top 10 here. – Art: 4/5. The wacky advent of the Cursed highlights an underwhelming set for artwork. However, the crew art, American ships, and SR pack certainly keep the score from being a 3. – Set Quality: 4/5. This set began the long slow decline of Pirates CSG. A reverse power creep started, and wouldn’t be reversed back until the final set. Sea monsters stink in-game, and the set features more boring ships than previous sets. However, a nice selection of named crew and a few standout ships per faction make it somewhat memorable. – New Content: 2/5. The Cursed have always been the worst faction of the Big 6, even with their introductory set. Sea monsters have always been overpriced. A large portion of the existing customer base was alienated by the overemphasis on the supernatural and magical elements, which is arguably what started the end. Very close to a score of 1, if not for the inherent “coolness” factor. – Collectability/Misc: 4/5. A point deducted for the low quality first print runs, but otherwise a fun one to buy. All 6 major factions for the first time, which leads to much collecting. I’m actually glad the Guichuan and LE’s are rare (they should be), and the SE boxes and cool SR pack are great reasons to buy DJC. = Overall: 14/20. The beginning of the end. The glory days of Pirates were over, with the dark cloud of Cursed madness threatening to take over the beloved game. OK, I’m being too dramatic! Heh, definitely a good set but the reputation is somewhat horrible between how many people left the game soon afterwards and the scratching issues. Get Davy Jones’ Curse on eBay! Click to buy South China Seas! 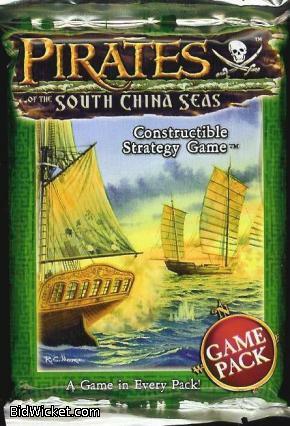 Pirates of the South China Seas (SCS) is by far the hardest set to acquire, and the first set released in 2006. The Jade Rebellion and their new ship type, Junks, highlighted the set. This is another fantastic set on par with the first three sets, doing extremely well on gameplay, theme, and artwork. Tough to beat, but tough to find. You can find all of the game pieces in the Master Spreadsheet, and I’ve ranked the Top 10 here. – Art: 5/5. Godmason already nailed it: “Huge variety of artwork. Creative, yet keeps the factions distinct.” Very colorful, pretty, diverse. Throw in the crew and UT’s, and possibly the best set for artwork. – Set Quality: 5/5. Absolutely amazing – as I’ve said before, I’ve fallen in love with this set over the past year and a half or so. The brief return of events can’t even keep it from a perfect 5, especially with the surprisingly good PR’s and the cool SR pack. – New Content: 5/5. I agree that the Junk and Turtle Ship keywords were somewhat underwhelming, but the Jade Rebellion faction makes up for it. Throw in the first 10 master, and there’s not much to dislike. – Collectability/Misc: 3/5. The hardest set to collect by far – commons from SCS can be harder to acquire than rares from other sets. It’s simply tough to get, and not quite as much fun to acquire since it will usually cost you a lot. However, this can also make you appreciate the ships more, as you’ll treasure them. The common PR’s make for a truly bizarre rarity distribution, as they can be cheaper than commons! = Overall: 18/20. Probably my favorite set of the last 2 years, but imperfect due to collectibility problems and the return of events. Discover the South China Seas on eBay! 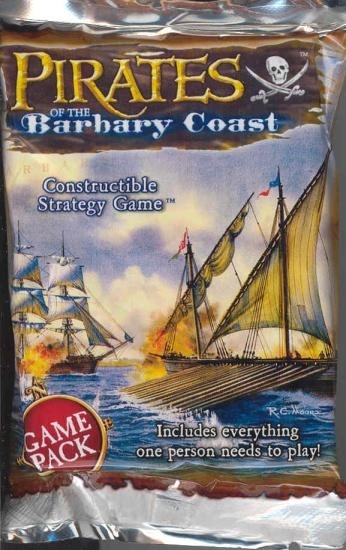 Click to buy Pirates of the Barbary Coast! Pirates of the Barbary Coast (BC) was the last set from 2005. The Barbary Corsairs and their Galleys gave players the best “minor faction” to use. This is another set with some historical tie-ins, and the only set without the Pirate faction. Overall the set is very balanced and playable, but not quite as exciting as the sets released just before and after it. You can find all of the game pieces in the Master Spreadsheet, and I’ve ranked the Top 10 here. – Art: 5/5. Tons of great artwork – the Barbary Corsairs are arguably the prettiest faction, while the crew art feels very thematic. – Set Quality: 4/5. The Corsairs are the strongest minor faction in the game and arguably better overall than the Cursed, one of the eventual Big 6 factions. Many other quality ships from the other factions, and the set feels very balanced overall – a return to normalcy after some problems in RV. However, the lack of the Pirate faction and (for me at least) the lack of any larger (4 or 5 masted) square rigged ships hold this set back from being a standout. – New Content: 4/5. Corsairs and galleys are welcome additions, but sometimes the set feels rather lackluster, especially in comparison to the first 3 sets. However, the combination of good named crew, fun UT’s, an awesome SR pack, and new editions of SM crew make up for the set being a little boring. – Collectability/Misc: 3/5. The Corsairs hogged almost all of the rare ships, while the cardboard crew PR’s were somewhat obnoxious and bizarre after the already-established crew chips. IMO, this set feels like the least likable of the first 5, so it loses a point for miscellaneous/intagibles as well, partly due to the above deficiencies. = Overall: 16/20. Interesting and cool, but doesn’t stand the test of time as well as SM/CC/RV. Search eBay to find the Barbary Coast! Click to buy Pirates of the Revolution! The mighty Constitution, signaling the arrival of the Americans! 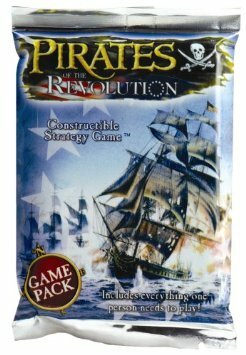 Pirates of the Revolution (RV) came out in 2005, featuring the introduction of the American faction. Revolution is sometimes considered the “best” set, with fast ships and some of the most usable ships in the game. RV also marked the first time Events were used, as well as new tins with varying artwork. One of the most historical sets, it’s also a favorite of American fans. You can find all of the game pieces in the Master Spreadsheet, and I’ve ranked the Top 10 here. – Art: 5/5. Absolutely agree with godmason – simply fantastic! – Set Quality: 4/5. The “best” set for gameplay, but unfortunately it was plagued by a small handful of OP (and arguably game-breaking) pieces. Also, I haven’t seen it discussed much, but the small Spanish representation and lack of inspiring named crew don’t help. – New Content: 4/5. The Americans are the highlight, with events as the lowlight. Another batch of interesting UT’s and the SR pack help make things interesting. – Collectability/Misc: 4/5. Collectibility gets a 3/3 here, but a point is lost due to the overall “likeability” being lower than SM and CC in my opinion. Indeed, the named crew options are rather atrocious for 3 out of the 5 nations, while the massive mistake that was events has not been fully corrected (banhammer please). = Overall: 17/20. The favorite of many old-school players, and for good reason. The reasons listed above keep it from being the best set ever. Ready to experience the awesomeness of Pirates of the Revolution? eBay has it. Click to buy Crimson Coast! 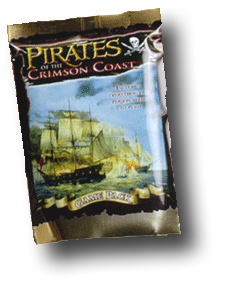 The second set came out in 2005 – Pirates of the Crimson Coast (CC). This set introduced the French, the Schooner ship type and forts. This is another classic set with a TON of great ships and crew. It can also lay claim to the title of “most perfect set”, as it got the highest rating from me when ranking all the sets. It also has the lowest number of votes for “least favorite set” in the Pirates CSG Survey. You can find all of the game pieces in the Master Spreadsheet, and I’ve ranked the Top 10 here. – Art: 4/5. More nice historical designs, with slightly more flair than SM. Nice red background on the cards. – Set Quality: 5/5. Large quantity of good or great ships for all main factions. For me, the forts make it from a 4.5 to a 5. Also, some rather memorable UT’s. – New Content: 5/5. The final entry to the “Big 4”, France was immediately established as a powerhouse faction. Terrain was a HUGE addition, while forts were a great mechanic – very aesthetic and fun, while providing a nice diversion from the usual naval affairs. – Collectability/Misc: 5/5. Picked up where SM left off with the faction-based checklist. A perfect little introduction to the super rare concept, and plenty of fantastic commons and uncommons for people with less money to spend. Almost loses a half point due to the cards seeming to fingerprint easily, but perhaps that’s just my experience. = Overall: 19/20. I actually prefer SM, but CC could be considered a more “perfect” set. Want to check out Pirates of the Crimson Coast? eBay is your best bet. Click to buy Spanish Main! Features: The original set that started it all! 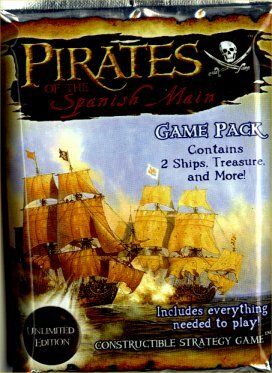 In 2004, Wizkids launched the Pirates of the Spanish Main product line. The first set introduced three factions – Pirates, English, and Spanish. Spanish Main (SM) was the first set I bought and it is still my favorite set. If you like the basics of the game, a limited number of factions, and a more historical set than most of the others, this is the set for you. You can find all of the game pieces in the Master Spreadsheet, and I’ve ranked the Top 10 here. – Art: 4/5. Great historically-based artwork that set the foundation for how the hulls and decks would look for the rest of the sets. It may look bland nowadays but I’ve always liked the historical theme of Pirates a lot. The cards are the perfect parchment color for the 17th/18th century. – Set Quality: 5/5. Tons of great ships, most of which are at least playable today. Large numbers of ships per faction meant that each was quite competitive. The standout ships are some of the most beloved and useful in history. – New Content: 5/5. Tough not to give a 5 here – without this set, there’s no game. Things were fun right from the start, with enough abilities and combos to keep things interesting. – Collectability/Misc: 4/5. Relatively easy to find, both back then and today. Not extremely difficult to get a full set, and rares were plentiful enough to keep you happy and not get bored with the typical rarity of CCG’s. Loses a point due to the somewhat inferior numbering system used in the first print runs, which becomes more confusing with the Unlimited edition’s release. = Overall: 18/20. The gold standard and foundation for everything that came afterwards. Still a fan favorite! Ready to buy Pirates of the Spanish Main? eBay is your best bet. DISCLAIMER: This Pirates CSG Review is extremely biased, and was written by a non-gamer who is likely the biggest current fan of this game in the world. As a result, I thought I’d never write a Pirates CSG Review, but I originally posted this in June 2017. 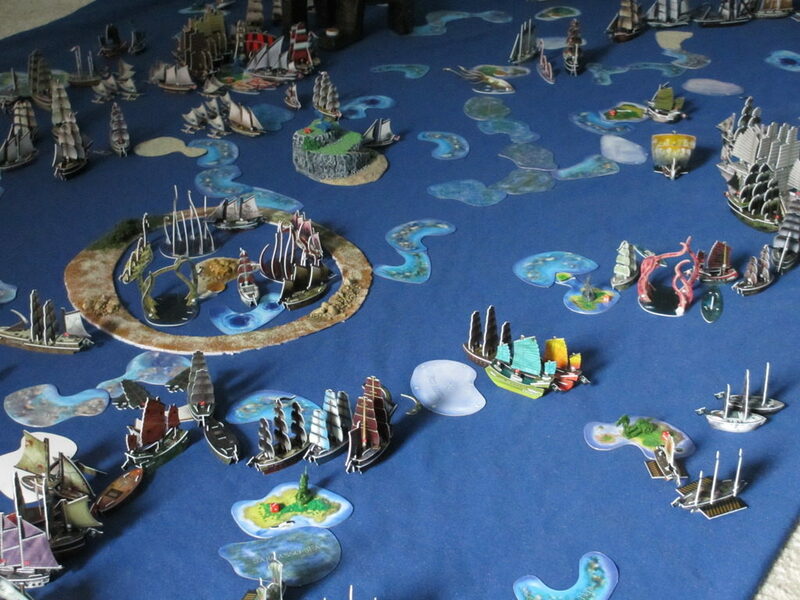 Pirates Constructible Strategy Game, also known as Pirates of the Spanish Main and Pirates of the Cursed Seas Pocketmodel Game, is a miniatures game about piracy, exploration, and naval warfare. Various aspects of the Age of Sail are introduced throughout the expansions that were released from 2004-2008. The theme is heavy on gold, plunder, combat at sea, and just general piratey goodness that you’d expect from the game’s title. Rating: 9/10. 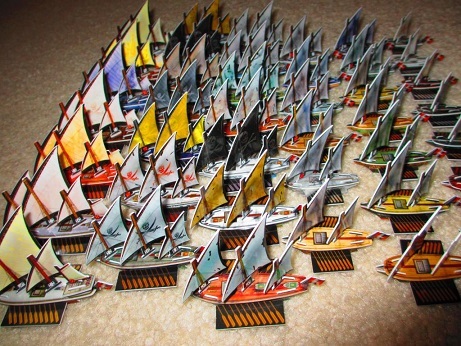 While the theme is consistent throughout the sets, Wizkids deviated from the historical theme by adding various sea creatures, non-historical ship types, and ship types that weren’t really contained to the Age of Sail. This also compromised the pirate theme to some extent, as the golden ages of piracy didn’t involve sea monsters, Vikings, or submarines. I have a Ranking of all the sets. The “game in every pack” was priced at an MSRP of $3.99. This gave you two ships, a crew, treasure, an island, and the full rules. Barely enough to play, I’d recommend at least 3 packs to play a two player game. However, this still leaves you with a very low base cost compared to other games. 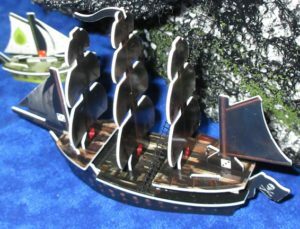 This is one of the biggest strengths of Pirates – it doesn’t take a fortune to amass a solid collection and an impressive armada of beautiful constructible ships. Nowadays, the game is often found for cheaper prices than when it was in print, as my eBay price history spreadsheet shows. The longevity of the game is also proven there, as prices have risen since around 2015. Since the game has constructible parts, this is an important aspect. The ships are more durable than you would expect, and the first ships I have that I built in 2005 have held up extremely well over the years. Some breakage problems may occur when building ships, but this is almost always due to rushing and inexperience. If a slot is too tight, widening it with a spare game piece (such as a pennant flag) or even a pen or item with similar width can often remedy the problem. In addition, the other items (islands, coins, crew chips) are very well-made, colorful, and very good quality when you consider that most of them are contained in small booster packs that are not very well protected. 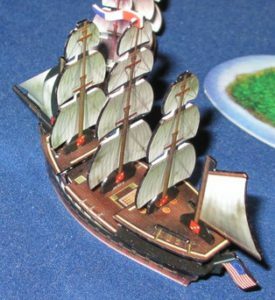 Most naval games have stock game pieces to represent specific unit types, or miniatures that can be painted or customized. Pirates is a beauty right out of the pack. Nearly every ship in the game has its own unique artwork, as do the named crew and even some of the common generic crew from the later sets. There’s something for everyone, whether it’s the historical ships of the first 3+ sets, crazy Cursed contraptions from the later sets, or really well-done crew portraits that look like paintings from the Age of Sail period. In addition, the pack artwork for the sets can draw you into the game by itself, especially if you’re nautically inclined like myself. The rules are presented in a somewhat haphazard fashion, because the Start Here rules assume you only have a single pack to play with. In addition, the Complete Game rules do not cover the basics that the Start Here rules cover, so you need both in order to play the full game. Lastly, there are numerous loopholes in the rules that were fixed by a large FAQ (The Pirate Code) that can be cumbersome to search through while playing something that apparently started off as a “beer and pretzels” game. This category is perhaps the most difficult to explain. I come from a non-gaming background and the full rules and scope of the game took some time to learn. In addition, almost all of the players I’ve taught (15 as of this writing) have said that Pirates is the most complex game they’ve ever played (including one person who saw a demo turn and was completely scared off immediately!). However, most “gamers” consider the game to be pretty light, and I think the complexity rating has something to do with when the ratings were assigned. As more expansions and game mechanics were released, the game has become more complex. The vast number of abilities available and the large amount of potential rules (including the Pirate Code and various confusion over rules loopholes) can make it a rather complex affair. Finally, one of the biggest strengths of the game, its wide-open and customizable nature (you can do whatever you want, there is no board, and there are endless combinations for fleet construction and build totals), actually makes the game far more complex, but in a good way. Taking everything into consideration, Pirates can be as simple or complex as you make it. The Start Here rules are decidedly simple, but when you incorporate the full rules and play larger or multiplayer games, it can become quite complex. There is considerable dice rolling involved, and quirks of the treasure distribution can lead to blowout victories. You’ll want to look at the fleets you’re facing, as well as thinking about what type of opponents you have. There is plenty of interaction within the combat system for the game. The possibility of bluffing for face down crew or treasure coins adds further interaction. Throw in the theme and personal nature of the gameplay, and you have a very fun and engaging game. The length of a player’s turn depends entirely on the build total chosen. For a standard 40 point game, turns usually take 1-5 minutes. As players become more experienced, play can go faster and be quite competitive and equal in nature. In huge games with hundreds or thousands of points, a single turn could take 30+ minutes to resolve. VASSAL Campaign Game 1, played from February-May of 2016. As said previously, this game has so many options for ships and crew that you’ll never run out of fleets to make. In addition, you can set up the map any way you like, so even the “board” is completely customizable. Last but not least, there are a TON of scenarios, house rules, and custom rulesets created for this game, many of which can be found in the Files section. I’m at nearly 400 plays and I cannot envision ever getting tired of it. This game is amazing. It works well at any player level, since even the rules are incredibly customizable. It works well at any number of players – I’ve had a ton of fun playing by myself, and in larger groups. The historical connections are very fun (including a handful of historical ships and crew), and the flavor text was a great idea to give the game a story. Finally, the collectible nature can be a good or bad thing. I’m in the middle on that aspect, but just the excitement of eBay auctions on rare pieces, one-of-a-kind prototypes, and “crazy collectors” on various forums can make the collecting experience fun. Also, this isn’t a game you need to spend much on to have a competitive fleet – oftentimes the commons are better in gameplay than the Limited and Special Edition items. Throw in a great VASSAL module (+ tutorial) and you even have the option of playing remotely against anyone in the world. 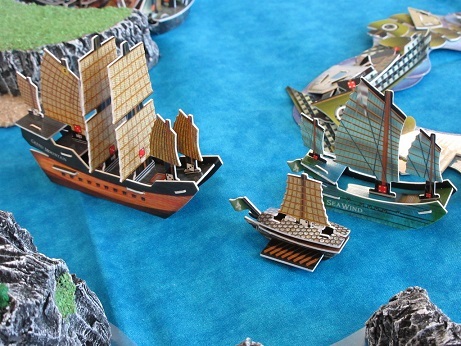 With a strong emphasis on the theme, an incredibly rich and diverse array of game pieces, the constructible aspect, and the stunningly massive customizability that can please any pirate, this game stands out from any competition. The artwork is top-notch, the miniatures are beautiful and creative, and the open world is truly inspiring. I cannot emphasize enough how much the customizable aspect helps this game. Non-gamers can play a game using the simple rules. 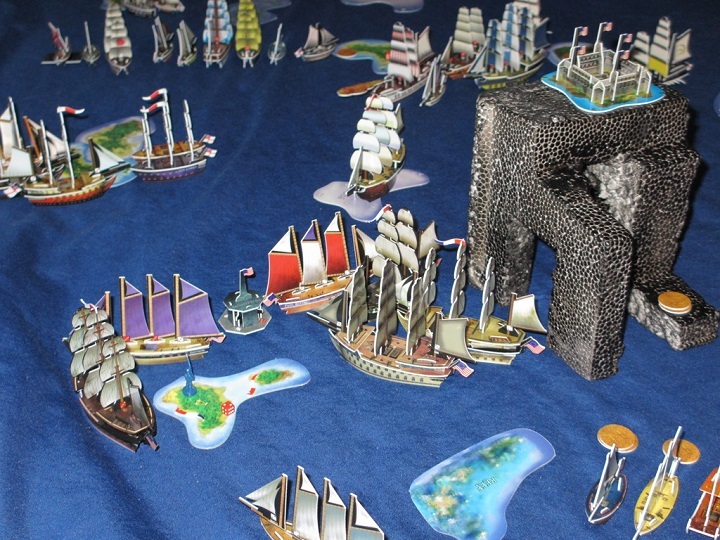 Wargamers can incorporate the ships and even some of the rules into their massive global conquests. 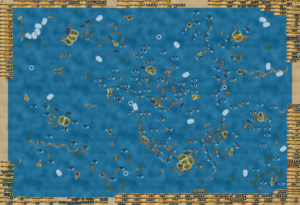 The game can be played on a small coffee table, multiple tables using round earth rules or whirlpools, or on a huge ocean in the VASSAL module. The 1,400+ fleets at Miniature Trading are just a taste of what’s possible when making the game a personal challenge to build the best or most creative fleets around. I’m as biased as it gets, but this is BY FAR the best game I’ve ever played and it’s a unique experience that has no equal. Want to buy Pirates CSG? Click here to buy on eBay, which has the best selection for the game. 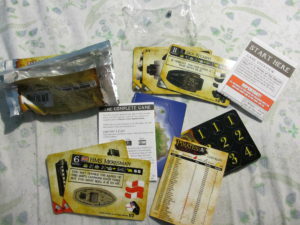 Hill’s Wholesale Gaming often has the best prices on packs, but not every set. If you go the pack route, you can check out my Sets page for more information and ratings to help guide your decision. Thanks for reading! I hope you enjoyed my Pirates CSG Review and get Pirates CSG fever like I’ve had for many years now! (I got back into the game in 2011) Feel free to leave comments below about your experience with this great game!